MapScope biedt u de mogelijkheid uw gegevens in kleur op de administratieve kaarten van de Europese landen weer te geven. Zo krijgt u een snelle en gemakkelijke visualisatie van de informatie, geografisch voorgesteld. MapScope's voornaamste functie is het inkleuren van een kaart om kwantitatieve of kwalitatieve verschillen tussen regio's te laten opvallen. Colour in entities based on their values. Entities values can be imported, manually entered or computed by MapScope. 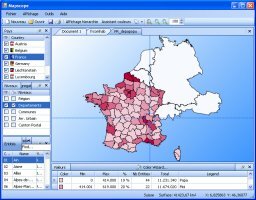 Using those values, MapScope provides a tool to automatically create a linear or quantilized repartition, which is associated with a color gradient or color palette. MapScope allow to import several data types from delimited text files. The import tool provide several options to compute values : sum, deduplication, count etc. MapScope can also export data. This function is very useful when the data are the result of a calculation made by MapScope : Areas of distance, aggregation level, find entity by XY coordinates etc. 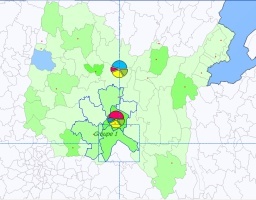 MapScope allows to define your own geographical clusters, sales area, catchment area, territorial division etc. The coloring in feature is one of the basic. But it is also often necessary to distinguish and separate treatment for entities set representing different geographical cluster : different areas of business, etc.. It is usually assembling several municipalities, postal codes etc. MapScope allows easy creation of these groups, either by importing a grouping key, either by manual selection. Creating equidistant area, proximity calculation. Choose a start point, a maximum radius and a band width, MapScope will automatically set a value and a color to the entities composing each area. One of the most interesting purpose of this feature is that you can then export the entities with their values. The coloring feature of Mapscope not only allows a quick visualization of the potential in regions or areas, but the importation of POI allows visualizing their positions. Certain users import client and prospect positions and attribute a different color to each of them.The entity’s background color can, for example, represent the absolute output / return. Visual analyses thereby become very easy. For each country, MapScope offers most existing administrative cuts. Region, state, province, municipalities, urban district, Postal Sector etc. MapScope can work on each of the administrative layers and to import data using the official codes of each country. Easy composition and layout to print personalized maps.